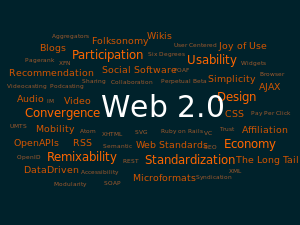 Web 2.0 describes World Wide Web sites that use technology beyond the static pages of earlier Web sites. The term was coined in 1999 by Darcy DiNucci and was popularized by Tim O'Reilly at the O'Reilly Media Web 2.0 conference in late 2004. Although Web 2.0 suggests a new version of the World Wide Web, it does not refer to an update to any technical specification, but rather to cumulative changes in the way Web pages are made and used. A Web 2.0 site may allow users to interact and collaborate with each other in a social media dialogue as creators of user-generated content in a virtual community, in contrast to Web sites where people are limited to the passive viewing of content. Examples of Web 2.0 include social networking sites, blogs, wikis, folksonomies, video sharing sites, hosted services, Web applications, and mashups. Whether Web 2.0 is substantively different from prior Web technologies has been challenged by World Wide Web inventor Sir Tim Berners-Lee, who describes the term as jargon. His original vision of the Web was "a collaborative medium, a place where we [could] all meet and read and write". After the recent reforms in the government jobs payscale employment news today are trending more with youth attracted more towards govt jobs rather than focusing on traditional IT or Engineering jobs.